(When I wasn’t cooking or visiting I was drawing a picture of my daughter. I wasn’t expecting much, since it was my second portrait, although it was going slow it was going really well. I had spent about 18-20 hours total. 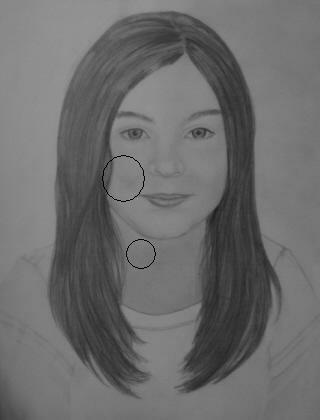 It’s a pretty large drawing at 14 x 17 and when I was doing the finishing touches, my eraser left 2 drag marks across her cheek. The marks weren’t noticeable until I put down a layer graphite and there it is! It looks almost like a grease spot with pencil marks on top. Needless to say, I was heartbroken and I must confess I was close to tears. I mean that was a lot of work that is completely unsalvageable. At first I thought it was the paper, but using the same eraser on a different paper the same thing happened. So another lesson I have learned is to NEVER use a white eraser no matter what the drawing books say, just use a kneaded eraser and pat . ) I decided to post the picture anyway. Below is the same picture with the spots circled so you could see what I was talking about. I have tried many times to get the likeness right in other drawings. But for some reason I can’t capture her as well as I did in this portrait. So…… this is my beautiful little girl Alana spots and all. There is alot of pressure in drawing portraits rather than other subjects. I mean if the smallest thing is off, it looks nothing like the person. My favorite part of drawing this portrait is the hair. I could have drawn each individual strand. I guess drawing all that fur on animals paid off. David was very helpful and would tell me when I needed to change something. I think he is going to be next on my hit list. Wow she is so beautifull. Lol!!!!!!! That last commenter is right – she is beautiful! I’m not sure we need one of David though. Maybe you could get one of the look he has when he says “You can be cured whenever you wake up and decided to be cured” and then I can use it for dart practice. I think it looks wonderful. I love the flower prints on my wall. Alana is beautiful if you drew her with a crayon. I’ll try to pester your blog more. Sure do miss you all. It’s hard to see the smudges on the small size we see. The picture looks very nice from this end. My husband likes to be helpful by pointing out the flaws. Sometimes I ask him to but other times I’m thinking I like what I’ve done and then it’s hard when he lets me know what is wrong – sometimes it’s just a matter of opinion. I guess we need to learn to go with “suggestions” only if we want to and really ignore them otherwise. Draftman’s Cleaning Pads, You should try one of these. These pads are excellent with Graphite. However, you do not rub with these pads. You actually, drop them, gently. If you decide to obtain one – I suggest using your copy of your lovely daughter. Or just a drawing of something you like and then smudge the drawing as close to the smudging on the original drawing. You simply drop the pad on the smudge and pick it staight up. have static electricity build up on the glass or the frame. It is wonderful piece. You should draw Her many more times. You know it doesn’t look odd or unplaced, but if you have photoshop you could clone it out! I tried to get this to a large size to see the damage. It is hard to notice. I think you should try softening the smudges on the other same type of paper. Another — Question? Are you keeping a rough piece of Grosgrain ribbon with you to clean the white eraser? It is just the white eraser? Not a plastic eraser for film? I’d like to have a seperate room from the sort of attic storage type area—one that only has what I need for the currant project–it turns out that eons of years ago when the house was built, I should have built two houses—whith one just being for a good sized working and storage area for me and I’m sure the husband would not have gone for that idea. I need a huge barn I think–that I’d like the look of and some great carpenter to arrange the space the best way possible.